I was going to begin this review by describing Gilbert Tew as a surprisingly good writer, but to do that would be to damn him with faint praise. To be sure, few people will remember Tew now, but his work was published between the wars in The Field, The Fishing Gazette, Angler’s Monthly and Country Sportsman, and with good reason, because he was an entertaining and thoughtful writer. This curious little book is his collected essays. Much of Tew’s life was spent working in the Indian Civil Service, a post he chose after much deliberation so that he could go fishing for Mahseer, but chance and fortune conspired to send him to Burma, where civil servants worked on the plains and the Mahseer were found in the hills. The first time he managed to squeeze in a trip, the river was out of order and there was nothing to do but pack up and go home again – twenty years were to pass before he caught one. It isn’t surprising that Tew lived for his leave, into which he packed as much fishing as he possibly could; the spur to his writing being the long months in between, during which he struggled with repeated attacks of malaria and had much time to think. This is reflected in this collection of his essays, which tend to be reflective, but also contain some fascinating accounts of fishing in the Irrawaddy and the fast rivers in the Burmese hill country, which is where he eventually connected with his Mahseer. 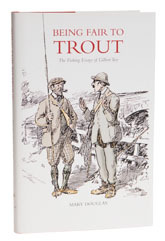 Mary Douglas is Tew’s daughter and a retired anthropologist; she provides background information and a fair amount of analysis of why anglers of Tew’s generation thought of trout the way they did.